Greetings! 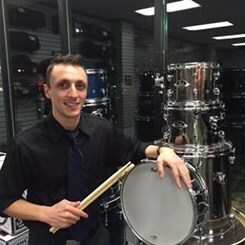 My name is Joe Baglia and I am one of the sales associates here at the Horsham Music & Arts. I earned my Bachelor's at Temple University in Audio Recording and Record Industry Studies, and would consider myself an audiophile and drum gear-guru. I have a rhythm section background (bass, guitar, voice, and primarily drums), which I learned to play since I was a young lad. In my free time I love to play with several different cover bands, including wedding bands, reggae, country, R&B, and the pop favorites! I have a passion for sharing what I know about musical instruments, their components, purposes, and most importantly assisting the future young musician in finding their voice. So if you have any questions or you are just curious about any drums or percussion products, please do not hesitate to reach out to me! I am happy to help out with your musical endeavors!